At its 17th meeting, held on 26–27 October 2017, ETAGE considered progress towards the achievement of European Vaccine Action Plan 2015–2020 (EVAP) goals, including efforts to control hepatitis B, increase the transparency of vaccine prices, address vaccine shortages and strengthen evidence-based decision-making related to national immunization policies and schedules. approved the development of technical documents and guidelines in the areas of life-course immunization, financial sustainability, integration and equity, and financial sustainability of immunization programmes in middle-income countries. ETAGE further discussed the possible establishment of an ETAGE working group on vaccine acceptance and demand to address increasingly apparent challenges in this area. ETAGE is made up of independent experts in a range of fields, including epidemiology, clinical medicine, laboratory surveillance and psychology. In line with its terms of reference, the 17th annual meeting was the last for several veteran members (Dr Cornelia Betsch, Professor Paolo Bonanni, Dr Vladimir Chulanov and Dr Hans Houweling). For the coming period, ETAGE comprises its chair, Professor Adam Finn, and 6 additional members: Professor F. Nur Baran Aksakal, Dr Antonietta Filia, Professor Alenka Kraigher, Dr Federico Martinón-Torres, Professor Roman Prymula and Dr Ole Wichmann. The 2017 annual meeting was also attended by Dr Kari Johansen, representing the Strategic Group of Experts on Immunization (SAGE), and chairs of NITAGs from 43 Member States of the Region. This brought together the 3 tiers of independent advisory committees (global, regional and national) that contribute to evidence-based policy-making on immunization. 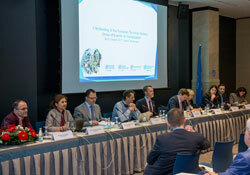 A full report of the meeting will be posted on the WHO/Europe website.